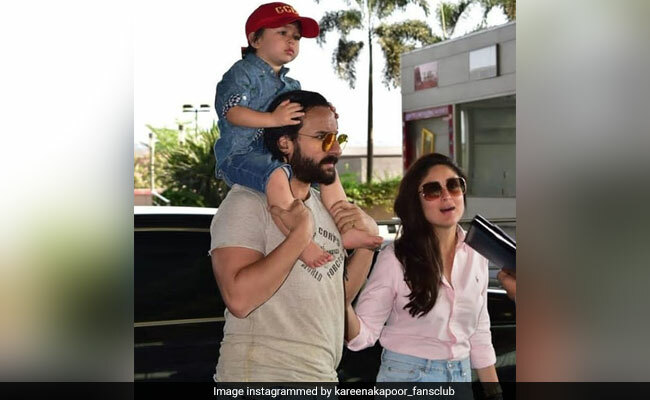 Paparazzi intrusion finally got to Saif Ali Khan, who has otherwise been very collected about the media attention around his toddler son Taimur. As per an IANS report, Saif was en route Pataudi with Taimur and Kareena Kapoor and at the airport, the actor, albeit calmly, snapped at the shutterbugs for incessantly taking pictures of Taimur with the camera flash on. "Bas karo yaar, bachcha andha ho jaayega (Stop it, the child will go blind)," Saif told the camerapersons following him. Taimur, comfortably seated atop his father's shoulders, waved as he moved through the sea of photographers. Taimur, 2, looked uber-cute in a blue shirt paired with shorts and a red cap. In addition, when the paparazzi requested Saif and Kareena to pose, the Sacred Games actor said: "Aap ko lena hai toh lo, ye pose karna thoda ajeeb hai (You want to take photos, you take them, it's weird to pose)," reports IANS. Taimur Ali Khan, who is frequently photographed by the paparazzi, is among the most followed celebrity kids. Several fan clubs on social media are dedicated to keeping track of the little nawab. Taimur frequently accompanies his parents to the shoots of their work-in-progress projects and recently, a picture of Taimur featuring in Kareena Kapoor's gym selfie went insanely viral. On the work front, Kareena Kapoor is filming Good News with Akshay Kumar, Diljit Dosanjh and Kiara Advani and later this year, she'll start filming Takht with director Karan Johar. Saif Ali Khan is filming Sacred Games 2 while he also has Taanaji: The Unsung Warrior in the pipeline.